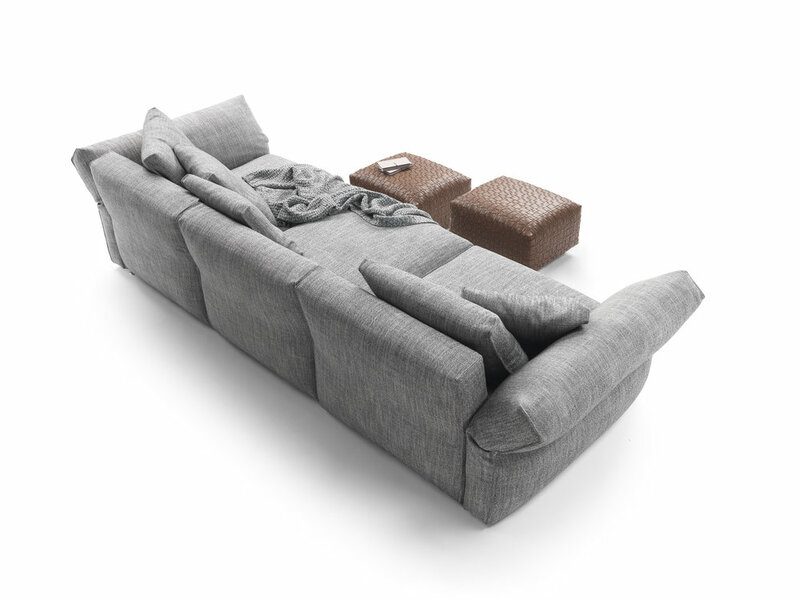 Balanced proportions combined with soft contours and generous padding make the Newbridge sofa warm and inviting. Bases, seats, seat backs and armrests all have the same thickness and feature extra-soft padding in an innovative, high-performance elastic material, making it crushproof, supple and uncommonly soft. These features ensure superior performance in terms of comfort, durability and breathability. The seat cushions also come with optional goose down filling. The reclinable armrest heightens the enveloping “cocoon” effect and can be adjusted to achieve the desired position. Elegant piping outlines the armrest, while an exquisite metal bar near the upholstery fold customizes the look; upholstery available in fabric or leather. The sofa sits on elegant, custom-designed cast metal feet. Newbridge is a highly-modular seating system and the many elements that comprise it are available in two depths: 93cm and 108cm, offering free rein to creative arrangement solutions -- from the most compact proportions, suited to urban spaces, to more expansive and elaborate compositions.